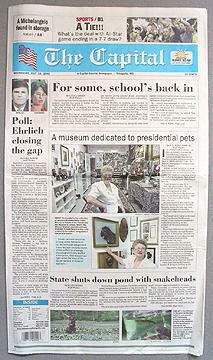 Over the years, our humble museum has been featured many times in the media. Below are a few of our favorite clippings. If you are a member of the media, feel free to contact us now. Presidential Pet Museum founder Claire McLean with her painting of Bush dog Miss Beazley. Donald Trump and his family do not seem to have any pets — there’s no cat fur on those gilded chairs of his Manhattan penthouse, and no dog walker leading a Trump pooch out for walks in nearby Central Park. Dave Baker, co-owner of the Presidential Pet Museum, figures Trump would acquire one because every president since Teddy Roosevelt has, although the GOP candidate has shown little interest in otherwise conforming to the norms of presidential aspirants…. The Presidential Pet Museum — such as it is — exists as a website full of information and pictures, plus a motley collection of memorabilia currently in storage. Ms. McLean, who is no longer able to operate the museum, and [co-owner] Dave Baker, who has other things to attend to, are trying to sell the website and artifacts in an online auction, so far without luck. One of the oldest items is the cowbell supposedly worn by President William Taft’s pet Pauline Wayne—the last cow to graze on the White House lawn. “It hasn’t been authenticated,” cautions Baker…. Yet to modern museum-goers, the authenticity of the cowbell might not be as interesting as learning that cows (and sheep and other animals) once roamed the White House lawn. In fact, it isn’t always the items themselves but the stories the museum holds that make it an interesting package. 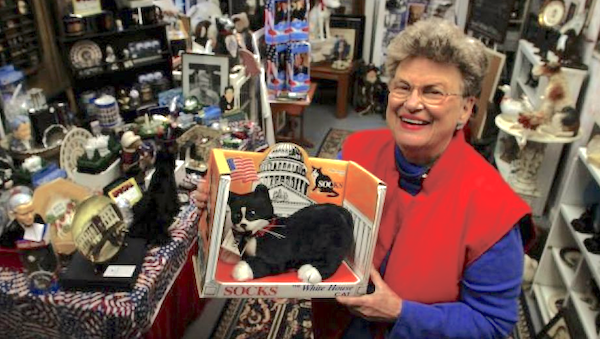 Mementos and art pieces honoring Socks, Checkers, Fala, Bo and more presidential pets are looking for a new owner. 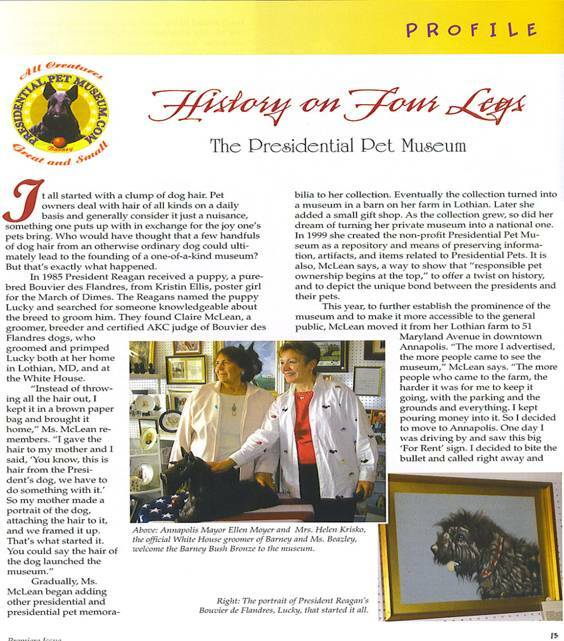 The Presidential Pet Museum, started by former White House groomer Claire McLean, first began in 1985. That was the year McLean’s mother painted a portrait of Ronald Regan’s dog Lucky, which McLean, now [almost] 83, completed by adding actual pieces of fur from the black dog’s coat to the canvas. This single painting inspired McLean to capture the nation’s love for all of the First Pets in one place…. McLean has decided to auction off her creation…. The auction on Flippa.com, which includes all of the museum’s belongings and its website, currently sits at $4,500 — a steal for all the history included in the sale. For 15 years, Claire McLean cultivated and shared a sentimental part of American history: the pets of presidents…. But now it’s up for grabs: from the website to the bronze statue of Barney the terrier, the Presidential Pet Museum is looking for a new owner…. The photographs, paintings and artifacts remain with Claire McLean, now [almost] 83 years old, awaiting their next debut. Just recently, that included a private showing for McLean’s fellow residents in her retirement home. Nancy Redd: So, you find out that you did a bad haircut on President Reagan’s dog, Lucky. How did you find out — did you get a letter? Did the CIA, the Secret Service come to your house? Claire McLean: No [laughing], but my mother wanted to send the portrait that she made of Lucky using his hair to Nancy Reagan, and I wouldn’t let her. I said, “No, I’m going to start a collection,” and from there it grew and grew, until finally I opened the doors and I had the Presidential Pet Museum. It was exciting. “We made this fabulous portrait of Lucky with her own hair and that’s the foundation for the pet museum,” McLean said. 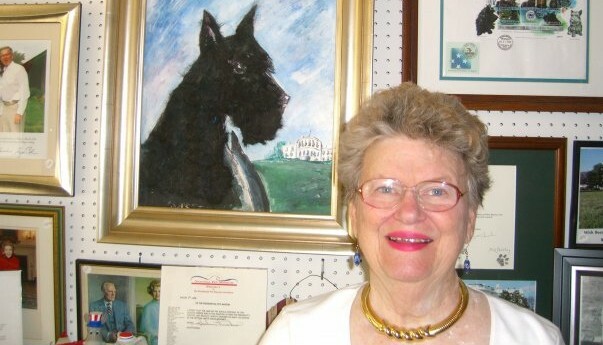 Ms. McLean also made portraits of President George W. Bush’s dogs Barney and Miss Beazley — also from their own hair. (President Obama has so far failed to answer her letters requesting parts of Bo’s and Sunny’s coats.) For years, those portraits and other presidential pet artifacts were displayed at the Presidential Pet Museum, a physical space…. But the recession took its toll on the museum. All the treasures of presidential pets past are now in storage … and visitable only virtually, through the museum’s website. “We’re broke,” Ms. McLean said. The “Lucky portrait” features real hair from Ronald Reagan’s dog. President and Nancy Reagan appointed Claire McLean first groomer. Claire McLean: And I couldn’t tell anyone I was grooming the President’s dog, it was always hush hush. Ike Sriskandarajah: Getting the secret assignment was huge. McLean: Oh, it was life changing for me. Sriskandarajah: But her first cut on the first pup was a snafu. McLean: Lo and behold, I cut a lot of the hair off and didn’t find out ’til later that actually Mrs. Reagan thought I cut too much off. Sriskandarajah: McLean walked out of the White House with her tail between her legs and too much puppy coat in her arms. McLean: But little did she know that that hair that I picked up and put in a brown paper bag and took home with me would become the foundation piece for the Presidential Pet Museum. Sriskandarajah: For the past decade, McLean, now retired, has been mining this neglected corner of American presidential history. Her Presidential Pet Museum is mostly in storage, boxes full of photos, clippings and memorabilia. But McLean keeps a few artifacts on hand. McLean: Now we do have the authentic cow bell that hung around Pauline Wayne’s neck. She was a Holstein cow that Howard Taft was very fond of. They called the cow his favorite pet. Would you like me to ring it for you? Sriskandarajah: Yeah, that’d be great. McLean: Alright, hang on a minute. Sriskandarajah: McClean’s pet project offers a new way of understanding the White House, through the eyes of animals that lived there. Take Pauline Wayne. She provided milk to the Taft family from 1910 to 1913 and was the last cow to graze at the White House. Which illustrates two historical points: one, America’s more rural, agrarian past, and two, President Taft’s appetite for dairy. The Presidential Pet Museum (no, we’re not making this up) highlights past and current White House pets…. 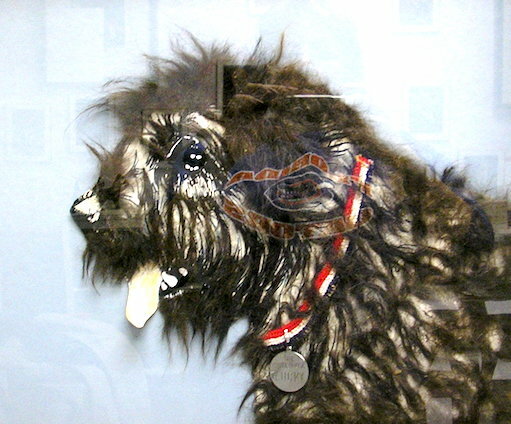 What began as a job grooming the “first dog” launched the museum. McLean first groomed Lucky in 1985, after she was contacted by the White House horticulturist, who knew that she bred [Bouvier des Flandres] dogs. She soon began grooming the dog regularly. She never met the first couple but did hear some feedback after one of Lucky’s hair-cutting sessions in advance of an official White House photo. “I heard that [first lady] Nancy [Reagan] thought that I cut too much hair off,” McLean said. 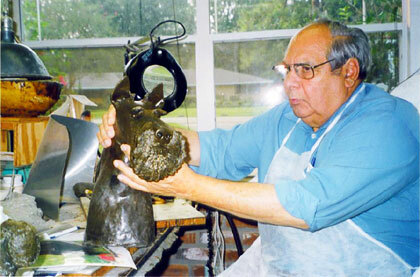 After the traffic death of Clinton’s dog Buddy in 2002, McLean appeared on NBC Nightly News and Good Morning America and talked about the collection. Soon, tour buses lined up at her 6-acre property, where she’d opened the museum in a barn. Most of the Presidential Pet Museum’s collection is made up of photographs and illustrations, and antique souvenir items relating to the presidents and their pets. Ms. McLean herself is probably the most valuable and interesting “item” in the collection, as she is a walking encyclopedia of presidential pet knowledge and enthusiastically shares her knowledge with anyone who asks…. They eventually hope to raise enough funds to move all the way to Washington, DC, and build a national museum for the entire country to enjoy. No one can say that Claire McLean isn’t trying. 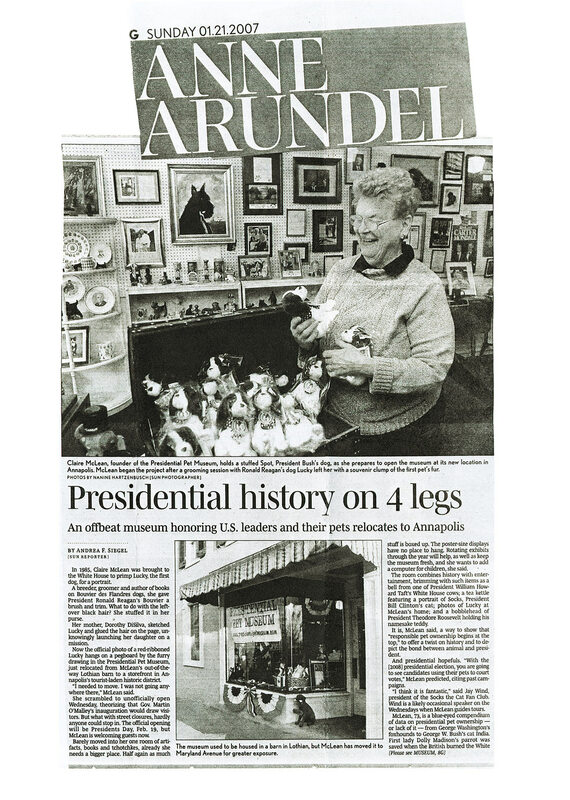 The 73-year-old grandmother has opened her Presidential Pet Museum for the third time in eight years…. We hope that Claire succeeds, because the only options for presidential pet tourists at the moment is the grave of Checkers, Richard Nixon’s dog, and whatever small (perhaps temporary) tribute is deemed appropriate at each pet-friendly Presidential Library. Claire’s collection is sadly devoid of exhibits from the exotic animals, although she does have a portrait of Miss Beazley Bush made from the dog’s hair; a portrait of Lucky Reagan made from that dog’s hair (and crafted by Claire’s mom), and a cowbell from Pauline Wayne Taft, the last cow to graze the White House Lawn. On April 3, the mayor of Annapolis will visit the Pet Museum to unveil a life-size bronze of Barney Bush, a Scottish terrier. It’s only the third statue of a presidential pet, according to Claire, joining a bronze Fala (another Scottie) at the FDR memorial in Washington, DC, and a copper statue of Laddie-Boy, Warren Harding’s airedale, in the Smithsonian. At first glance, Claire McLean’s Presidential Pet Museum appears to be just another antique store — full of Richard Nixon bobbleheads and Scottish terrier knickknacks. But if you look pass the kitsch, listen to McLean’s White House pet trivia and add a little imagination, it can be an experience like no other. McLean said that she believes the bell once adorned Pauline because the man who donated it wrote that it once belonged in the White House. “Sorry, there’s no way of authenticating it, but it could be the cow bell,” McLean said pointing to a photograph of the cow on the White House lawn with a bell around its neck…. McLean is enamored by the presidency, and her infatuation is apparent in her collection and sometimes even her jewelry — she wears American flag earrings when she goes out…. McLean loves the attention the museum gets just for being different. With no background in museum management or retail, she is content to live her dream of running a pet museum that pays homage to the nation’s highest office. McLean, 73, is a blue-eyed compendium of data on presidential pet ownership — or lack of it — from George Washington’s foxhounds to George W. Bush’s cat India…. [President Bush’s] fondness for his pooch echoes that of Franklin Roosevelt, who was so attached to his Scottish Terrier, Fala, he’s even memorialized with him. Claire McLean, who runs the Presidential Pet Museum, says that kind of genuine animal love humanizes a commander-in-chief. Among the exhibits at the Presidential Pet Museum are objects that stray a bit far from the theme: portraits of presidents without pets, paintings of pets without presidents and a few items with no obvious relation to either presidents or pets, such as the statue of Mr. Peanut. But it’s hard to understate the public fascination with presidents and their pets, a topic enshrined by Claire McLean at her tiny museum…. The museum is housed inside an old pole barn … a 15-by-60-foot space without restroom facilities. Admission is free. Nonetheless, some of McLean’s visitors take one look at her collection and storm out, upset that they have driven so far for so little. Others stay for hours, leafing through McLean’s giant scrapbook of photographs and news clippings of presidents and their pets. Claire McLean, who has literally written the book on the dog breed Bouvier des Flandres, was once the official groomer of Lucky, President Reagan’s Bouvier. 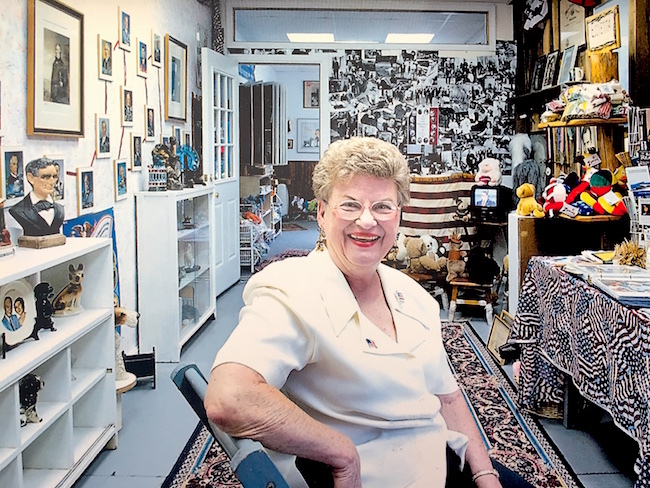 Now retired, she collects trinkets, photographs, books, tchotchkes, all related to the men who have been president and the pets who have been by their side — a mish-mash she calls, rather grandly, the Presidential Pet Museum. It’s a quirky little place…. A few years ago, she put up a Web site, and it gets thousands of hits. Interest goes up around election time. She gets dozens of e-mails a week asking all sorts of questions…. McLean opened the museum in 1999 and gets 50 to 100 visitors a year, by appointment only. She can’t accommodate more. There is very little parking. There are no bathrooms. It isn’t wheelchair-accessible. It isn’t even zoned for this sort of thing. None of that bothers McLean, who at 71 started this as a retirement hobby but has visions of something more. “While we’re a ragtag, small museum and very humble, it’s not what we are, it’s what we can become,” she said. She has a small foundation that is working to create a national pet museum somewhere in Washington, perhaps in Southeast where the new baseball stadium will be built. She has dreams of a tribute to what she calls “the most glorious relationships on Earth” — the relationships between people and their pets — and wants to promote responsible pet ownership, too. The Web site is more organized than the museum, which is crammed into two small rooms, making logical display a challenge. There are pictures of presidents, pictures of pets and often pictures of presidents with their pets, in no particular order. Stuffed toys in the likeness of Barney, the Scottish terrier who now resides in the White House, and Spot, the late springer spaniel who also belonged to George W. Bush, are scattered around. Pictures of dogs — not necessarily presidential dogs — line some walls. A Discovery Channel documentary entitled, First Dogs, plays on the VCR. When McLean guides tours, though, the stories flow…. There is also no picture of McLean with the Reagans’ Lucky. An offer to snap a photo of the groomer and her charge was made, but McLean demurred. She’s sorry now, but still holds onto the fact that she has that fuzzy black hair. 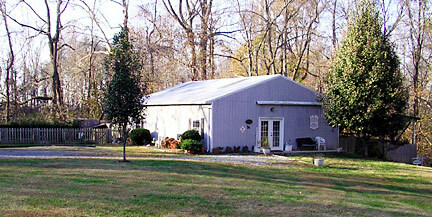 The museum at its 2002–2006 location in Lothian, Va. It has moved several times. Republican or Democrat. Incumbent or challenger. Controversial or comfortable. Dogs or cats. There is one thing most U.S. presidents have in common: a pet or two warming up the White House. Those pets — from George Washington’s stallions and hound dogs through George W. Bush’s dogs Spot and Barney — are given their proper tribute at the Presidential Pet Museum. The museum, open by appointment and not connected to the U.S. government, is a labor of love for Claire McLean. How does Barney Bush look in bronze? Who was the last cow to graze on the White House lawn? These are just some of the first pets featured at the Presidential Pet Museum…. This homage to animal history includes numerous photographs of first families and their pets as well as little known facts about the animals that have called the White House home. 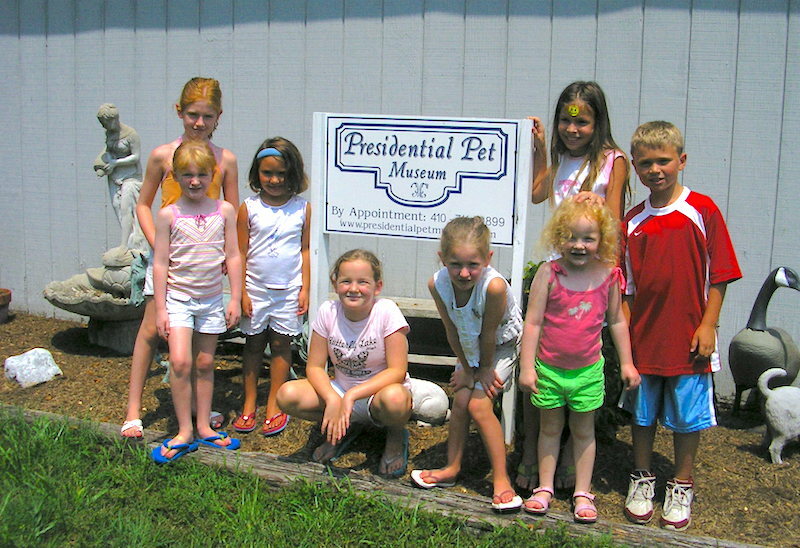 The Presidential Pet Museum … is one of Washington’s most obscure and exclusive museums. About 300 by-appointment-only visitors a year brave her dogs and tour it. This Web site is nothing if not a surefire way to get kids interested in the presidency. The Museum [re-]opened last week with a bang: dog show, barbecue, petting zoo and all. Visitors wandered inside to find two rooms filled with presidential photos and paraphernalia, from Clinton clips to Ford photos to Macaroni, the Kennedy pony…. In her museum, McLean wants to interest kids in the presidents and their stories through their pets. “When you ask children if they want to learn about the presidents, they aren’t very interested. When you ask them if they want to learn about their pets, it’s a different story,” she says. Youth visitors at the original museum site. The 4-year-old museum … consists of a ragtag menagerie of presidential and White House pet memorabilia collected over the years. 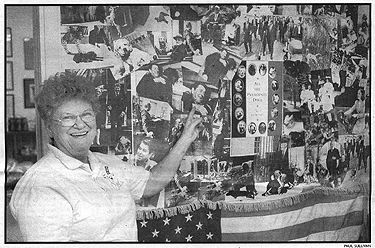 From online sales, flea markets and trips to presidential museums across the country, she has gleaned all sorts of presidential knickknacks, newspaper and magazine clippings of presidents and their furry friends, placards and campaign memorabilia, including thank-you notes from presidents to her mother and herself…. The notion really stuck when former President Clinton’s dog, Buddy, was killed by a car in January. “All the TV news people found me through the site and came down here to interview me. They were down here all day. Members of the media: Feel free to contact us now for help with your story about our museum.